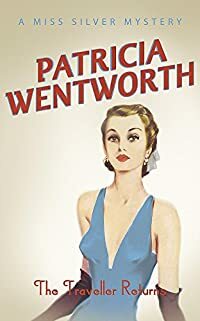 The Traveller Returns by Patricia Wentworth is a Miss Silver mystery and it was first published in 1948. As has often been said by many people – you can’t beat a vintage crime read when you’re in need of a respite from your own world. Not that there’s anything desperately wrong here at Pining but I’m just so fed up with the weather and this never ending winter. Snow again – and although that isn’t unusual at Easter in Scotland, it is unusual when we’ve had so much snow on and off since October. Anyway, back to the book. The Traveller Returns cheered me up despite the weather. The setting is Britain in wartime. Philip Jocelyn’s wife Anne had died in the dark on a beach in Brittany while trying to escape Nazi France early in the war. Three years have passed since then and Philip has fallen in love with Lyndall who had been one of Anne’s bridesmaids. But Anne turns up back in England and walks into her home – mink coat, pearls and all, she says that it was her cousin Annie Joyce who had died on the beach. Annie and Anne did look remarkably alike apparently but Philip isn’t convinced although everyone else is. He’s sure it was his wife Anne that he had had to bury quickly. Enter Miss Silver, retired governess and now successful private detective, although you wouldn’t know that from her shabby appearance. All is well as she gets to the bottom of it all, whilst knitting up stockings and socks for Ethel’s husband and three little boys. A very enjoyable read. This entry was posted in Books and tagged comfort read, Miss Silver mystery, Patricia Wentworth, The Traveller Returns, vintage crime, wartime mystery by Katrina. Bookmark the permalink. Oh, this sounds good! I like the Miss Silver books and I love wartime books. Add in a possible mistaken identity and I am as happy as can be. We had snow yesterday too. It all melted right away but I am still just done with it. A few small signs of spring would be nice. Everything is so dull and brown still. I think you’ll really enjoy the book then. Things are even worse now, we got about 2 inches of snow overnight and it has snowed all day. Tomorrow it’s to be bright and much warmer – for one day only! Typical UK weather. This is usually a very green place but all the grass (when you can see it) is yellow and dead looking, very strange. Sounds like an intriguing story, and what a classic late 1940s cover picture in the illustration. I hope your weather bucks up soon – I expect the plants are working away underground anyhow, ready to burst forth into cheery bloom. Do you have a Forsythia shrub? – they always brighten the garden when in flower in Spring. We had more snow overnight and all day today, but tomorrow is to be nice. Yes I do have Forsythia and it looks like it should burst into bloom any day now. The snowdrops are still out though, being under snow so often has really prolonged their season. I have been re-reading Margery Allingham myself, and I may move on to Josephine Tey next. I’ve read all of Tey’s books, she didn’t really write all that many, compared with Allingham anyway. I still have a lot of hers to read. I’ve just had a look on Amazon (I don’t know if you use it) and I see there are used paperbacks for £0.01. Or if you use a Kindle it would cost £1.99. I think I’ll order The Case of William Smith – for 56p plus postage of course!